Regurgitation, perhaps one of the most perplexing bird behaviors, occurs when a bird throws up small amounts of food with the intention of feeding it to a loved one. Regurgitation is perfectly normal behavior in birds, and not a reason for concern. Vomiting, however, is a sign of illness that should be addressed immediately. Regurgitation is a natural behavior related to bird parenting. In most cases, a regurgitating bird will bob its head and stretch out its neck during the process, and the food it produces will not be digested. In addition, a regurgitating bird will not show signs of illness or distress. Regurgitation behavior in birds might best be observed in the nest. When a hen is sitting on eggs, the father of her chicks will many times gorge himself, only to return to the nest and purge to feed his mate. 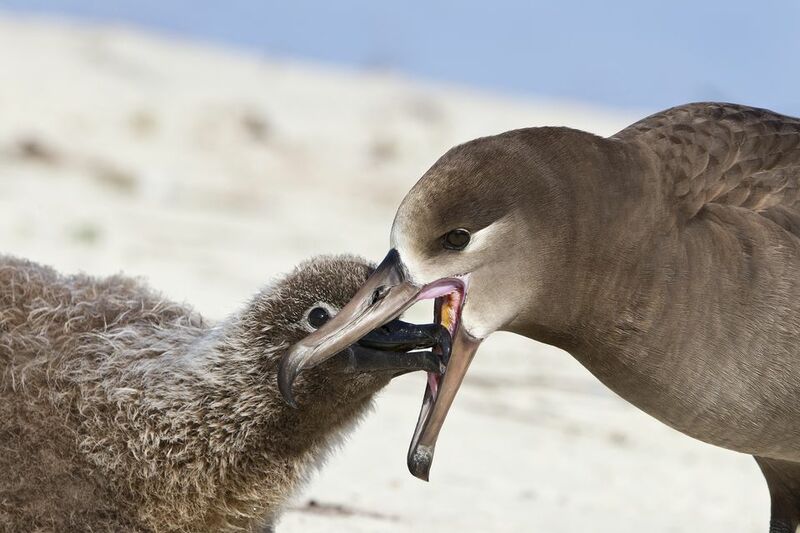 Once the eggs hatch, the resulting baby birds are completely dependent on their parents for food, requiring the adult birds to regurgitate their meals to feed their newborn offspring. It is a very efficient way of delivering food to their young. They needn't carry anything and it has already been warmed up. because it is partially digested, it is a little easier for the babies to absorb the food delivered to them. Regurgitation is also a way that birds show each other that they are "interested". This is a natural courting behavior, and it's very common for pet birds to regurgitate on other birds, their favorite people, or even their favorite toys. If your bird regurgitates on you, it's most likely a sign of affection. While regurgitation is completely normal behavior, it is important to note that your bird may not be truly regurgitating every time it throws up. If it is vomiting rather than regurgitating, there is a good chance that it is ill or suffering from parasites. It can be difficult to distinguish regurgitation from vomiting, but it's important to do so. While true regurgitation is not stressful or violent in nature, a bird that is vomiting from illness will sometimes quickly flick its head, slinging the partially digested food all over. You may find digested food around the cage, or notice that your bird's head feathers are stuck together or caked with food. A vomiting bird will spew the contents of its stomach in a very messy and random manner. A bird that is regurgitating food brings it up from its crop and it is far more precise; in other words, her aim is better when she is regurgitating. Provide your bird with an appropriate diet for its species, size, and age. If you are unsure about exactly which food is best for your pet, ask your vet. Monitor your bird carefully when it's out of the cage, making sure it doesn't ingest stray items that could cause a blockage. Carefully monitor your bird's surroundings both in and outside the cage to be sure there are no potential choking hazards or toxic substances in the area. In addition, keep a careful eye on your bird and check the cage when you're cleaning it. If you notice signs of vomiting as opposed to regurgitation, take your bird to the vet as quickly as possible. While the problem may be benign, it may also be an early sign of a potentially serious problem.